To validate our analyses, I’ve been using randomisation to show that the results we see would not arise due to chance. For example, the location of pixels in an image can be randomised and the analysis rerun to see if – for example – there is still colocalisation. A recent task meant randomising live cell movies in the time dimension, where two channels were being correlated with one another. In exploring how to do this automatically, I learned a few new things about permutations. Here is the problem: If we have two channels (fluorophores), we can test for colocalisation or cross-correlation and get a result. Now, how likely is it that this was due to chance? So we want to re-arrange the frames of one channel relative to the other such that frame i of channel 1 is never paired with frame i of channel 2. This is because we want all pairs to be different to the original pairing. It was straightforward to program this, but I became interested in the maths behind it. Which basically means: for n frames, there are n! number of permutations, but you need to subtract and add diminishing numbers of different permutations to get to the result. Full description is given in the wikipedia link. Details of inclusion and exclusion are here. I had got as far as figuring out that the ratio of permutations to derangements converges to e. However, you can tell that I am not a mathematician as I used brute force calculation to get there rather than write out the solution. Anyway, what this means in a computing sense, is that if you do one permutation, you might get a unique combination, with two you’re very likely to get it, and by three you’ll certainly have it. Back to the problem at hand. It occurred to me that not only do we not want frame i of channel 1 paired with frame i of channel 2 but actually it would be preferable to exclude frames i ± 2, let’s say. Because if two vesicles are in the same location at frame i they may also be colocalised at frame i-1 for example. This is more complex to write down because for frames 1 and 2 and frames n and n-1, there are fewer possibilities for exclusion than for all other frames. For all other frames there are n-5 legal positions. This obviously sets a lower limit for the number of frames capable of being permuted. The answer to this problem is solved by rook polynomials. You can think of the original positions of frames as columns on a n x n chess board. The rows are the frames that need rearranging, excluded positions are coloured in. Now the permutations can be thought of as Rooks in a chess game (they can move horizontally or vertically but not diagonally). We need to work out how many arrangements of Rooks are possible such that there is one rook per row and such that no Rook can take another. If we have an 7 frame movie, we have a 7 x 7 board looking like this (left). The “illegal” squares are coloured in. Frame 1 must go in position D,E,F or G, but then frame 2 can only go in E, F or G. If a rook is at E1, then we cannot have a rook at E2. And so on. where \(L_n^\alpha(x)\) is an associated Laguerre polynomial. The solution in this case is 8 possibilities. From 7! = 5040 permutations. Of course our movies have many more frames and so the randomisation is not so limited. In this example, frame 4 can only either go in position A or G.
Why is this important? The way that the randomisation is done is: the frames get randomised and then checked to see if any “illegal” positions have been detected. If so, do it again. When no illegal positions are detected, shuffle the movie accordingly. In the first case, the computation time per frame is constant, whereas in the second case it could take much longer (because there will be more rejections). In the case of 7 frames, with the restriction of no frames at i ±2, then the failure rate is 5032/5040 = 99.8%. Depending on how the code is written, this can cause some (potentially lengthy) wait time. Luckily, the failure rate comes down with more frames. What about it practice? The numbers involved in directly calculating the permutations and exclusions quickly becomes too big using non-optimised code on a simple desktop setup (a 12 x 12 board exceeds 20 GB). The numbers and rates don’t mean much, what I wanted to know was whether this slows down my code in a real test. To look at this I ran 100 repetitions of permutations of movies with 10-1000 frames. Whereas with the simple derangement problem permutations needed to be run once or twice, with greater restrictions, this means eight or nine times before a “correct” solution is found. The code can be written in a way that means that this calculation is done on a placeholder wave rather than the real data and then applied to the data afterwards. This reduces computation time. For movies of around 300 frames, the total run time of my code (which does quite a few things besides this) is around 3 minutes, and I can live with that. So, applying this more stringent exclusion will work for long movies and the wait times are not too bad. I learned something about combinatorics along the way. Thanks for reading! The first derangement issue I mentioned is also referred to as the hat-check problem. Which refers to people (numbered 1,2,3 … n) with corresponding hats (labelled 1,2,3 … n). How many ways can they be given the hats at random such that they do not get their own hat? Adding i+1 as an illegal position is known as problème des ménages. This is a problem of how to seat married couples so that they sit in a man-woman arrangement without being seated next to their partner. Perhaps i ±2 should be known as the vesicle problem? The post title comes from “The Second Arrangement” by Steely Dan. An unreleased track recorded for the Gaucho sessions. This paper really was a team effort. Faye Nixon and Tom Honnor are joint-first authors. Faye did most of the experimental work in the final months of her PhD and Tom came up with the idea for the mathematical modelling and helped to rewrite our analysis method in R. Other people helped in lots of ways. George did extra segmentation, rendering and movie making. Nick helped during the revisions of the paper. Ali helped to image samples… the list is quite long. We used a 3D imaging technique called SBF-SEM to see microtubules in dividing cells, then used computers to describe their organisation. Serial block face scanning electron microscopy. This method allows us to take an image of a cell and then remove a tiny slice, take another image and so on. We then have a pile of images which covers the entire cell. Next we need to put them back together and make some sense of them. We use a computer to track where all the microtubules are in the cell. In dividing cells – in mitosis – the microtubules are in the form of a mitotic spindle. This is a machine that the cell builds to share the chromosomes to the two new cells. It’s very important that this process goes right. If it fails, mistakes can lead to diseases such as cancer. Before we started, it wasn’t known whether SBF-SEM had the power to see microtubules, but we show in this paper that it is possible. We can see lots of other cool things inside the cell too like chromosomes, kinetochores, mitochondria, membranes. We made many interesting observations in the paper, although the focus was on the microtubules. So you can see all the microtubules, what’s interesting about that? The interesting thing is that our resolution is really good, and is at a large scale. This means we can determine the direction of all the microtubules in the spindle and use this for understanding how well the microtubules are organised. Previous work had suggested that proteins whose expression is altered in cancer cause changes in the organisation of spindle microtubules. Our computational methods allowed us to test these ideas for the first time. Resolution at a large scale, what does that mean? The spindle is made of thousands of microtubules. With a normal light microscope, we can see the spindle but we can’t tell individual microtubules apart. There are improvements in light microscopy (called super-resolution) but even with those improvements, right in the body of the spindle it is still not possible to resolve individual microtubules. SBF-SEM can do this. It doesn’t have the best resolution available though. A method called Electron Tomography has much higher resolution. However, to image microtubules at this large scale (meaning for one whole spindle), it would take months or years of effort! SBF-SEM takes a few hours. Our resolution is better than light microscopy, worse than electron tomography, but because we can see the whole spindle and image more samples, it has huge benefits. What mathematical modelling did you do? Cells are beautiful things but they are far from perfect. The microtubules in a mitotic spindle follow a pattern, but don’t do so exactly. So what we did was to create a “virtual spindle” where each microtubule had been made perfect. It was a bit like “photoshopping” the cell. Instead of straightening the noses of actresses, we corrected the path of every microtubule. How much photoshopping was needed told us how imperfect the microtubule’s direction was. This measure – which was a readout of microtubule “wonkiness” – could be done on thousands of microtubules and tell us whether cancer-associated proteins really cause the microtubules to lose organisation. The paper is published in Journal of Cell Science and it was a great experience. Last November, we put up a preprint on this work and left it up for a few weeks. We got some great feedback and modified the paper a bit before submitting it to a journal. One reviewer gave us a long list of useful comments that we needed to address. However, the other two reviewers didn’t think our paper was a big enough breakthrough for that journal. Our paper was rejected*. This can happen sometimes and it is frustrating as an author because it is difficult for anybody to judge which papers will go on to make an impact and which ones won’t. One of the two reviewers thought that because the resolution of SBF-SEM is lower than electron tomography, our paper was not good enough. The other one thought that because SBF-SEM will not surpass light microscopy as an imaging method (really! **) and because EM cannot be done live (the cells have to be fixed), it was not enough of a breakthrough. As I explained above, the power is that SBF-SEM is between these two methods. Somehow, the referees weren’t convinced. We did some more work, revised the paper, and sent it to J Cell Sci. J Cell Sci is a great journal which is published by Company of Biologists, a not-for-profit organisation who put a lot of money back into cell biology in the UK. They are preprint friendly, they allow the submission of papers in any format, and most importantly, they have a fast-track*** option. This allowed me to send on the reviews we had and including our response to them. They sent the paper back to the reviewer who had a list of useful comments and they were happy with the changes we made. It was accepted just 18 days after we sent it in and it was online 8 days later. I’m really pleased with the whole publishing experience with J Cell Sci. * I’m writing about this because we all have papers rejected. There’s no shame in that at all. Moreover, it’s obvious from the dates on the preprint and on the JCS paper that our manuscript was rejected from another journal first. ** Anyone who knows something about microscopy will find this amusing and/or ridiculous. *** Fast-track is offered by lots of journals nowadays. It allows authors to send in a paper that has been reviewed elsewhere with the peer review file. How the paper has been revised in light of those comments is assessed by at the Editor and one peer reviewer. Parallel lines is of course the title of the seminal Blondie LP. I have used this title before for a blog post, but it matches the topic so well. Statistical hypothesis testing, commonly referred to as “statistics”, is a topic of consternation among cell biologists. This is a short practical guide I put together for my lab. Hopefully it will be useful to others. Note that statistical hypothesis testing is a huge topic and one post cannot hope to cover everything that you need to know. What statistical test should I do? To figure out what statistical test you need to do, look at the table below. But before that, you need to ask yourself a few things. What will the test tell you? What is your hypothesis? What will the p value (or other summary statistic) mean? If you are not sure about any of these things, whichever test you do is unlikely to tell you much. The most important question is: what type of data do you have? This will help you pick the right test. Normally-distributed – this means it follows a “bell-shaped curve” otherwise called “Gaussian distribution”. Not normally-distributed – data that doesn’t fit a normal distribution: skewed data, or better described by other types of curve. Binomial – this is data where there are two possible outcomes. A good example here in cell biology would be a mitotic index measurement (the proportion of cells in mitosis). A cell is either in mitosis or it is not. Other – maybe you have ranked or scored data. This is not very common in cell biology. A typical example here would be a scoring chart for a behavioural effect with agreed criteria (0 = normal, 5 = epileptic seizures). For a cell biology experiment, you might have a scoring system for a phenotype, e.g. fragmented Golgi (0 = is not fragmented, 5 = is totally dispersed). These arbitrary systems are a not a good idea. Especially, if the person scoring is unblinded to the experimental procedure. Try to come up with an unbiased measurement procedure. Modified from Table 37.1 (p. 298) in Intuitive Biostatistics by Harvey Motulsky, 1995 OUP. What do “paired/unpaired” and “matched/unmatched” mean? Most of the data you will get in cell biology is unpaired or unmatched. Individual cells are measured and you have say, 20 cells in the control group and 18 different cells in the test group. These are unpaired (or unmatched in the case of more than one test group) because the cells are different in each group. If you had the same cell in two (or more) groups, the data would be paired (or matched). An example of a paired dataset would be where you have 10 cells that you treat with a drug. You take a measurement from each of them before treatment and a measurement after. So you have paired measurements: one for cell A before treatment, one after; one for cell B before and after, and so on. The examples below assume that you have values in waves called data0, data1, data2,… substitute the wavenames for your actual wave names. However, if you only have a small number of measurements, or you want to be sure, you can do a test. There are several tests you can do (Kolmogorov-Smirnoff, Jarque-Bera, Shapiro-Wilk). The easiest to do and most intuitive (in Igor) is Shapiro-Wilk. If p < 0.05 then the data are not normally distributed. Statistical tests on normally distributed data are called parametric, while those on non-normally distributed data are non-parametric. The mean and sd are also stored as variables (V_avg, V_sdev). StatsQuantiles calculates V_median, V_Q25, V_Q75, V_IQR, etc. Note that you can just get the median by typing Print StatsMedian(data0) or – in Igor7 – Print median(data0). There is often more than one way to do something in Igor. Use this for normally distributed data where you have test versus control, with no other groups. For paired data, use the additional flag /PAIR. For the non-parametric equivalent, if n is large computation takes a long time. Use additional flag /APRX=2. If the data are paired, use the additional flag /WSRT. If you have more than two groups, do not do multiple versions of these tests, use the correct method from the table. For normally-distributed data, you need to do a 1-way ANOVA followed by a post-hoc test. The ANOVA will tell you if there are any differences among the groups and if it is possible to investigate further with a post-hoc test. You can discern which groups are different using a post-hoc test. There are several tests available, e.g. Dunnet’s is useful where you have one control value and a bunch of test conditions. We tend to use Tukey’s post-hoc comparison (the /NK flag also does Newman-Keuls test). The non-parametric equivalent is Kruskal-Wallis followed by a multiple comparison test. Dunn-Holland-Wolfe method is used. It’s unlikely that this kind of data will be obtained in a typical cell biology experiment. There are also operations for StatsFriedmanTest and StatsCochranTest. In the lab we have, in the past, done survival/hazard analysis. This is a bit more complex and we used SPSS and would do so again as Igor does not provide these functions. The good news is that all of this is a lot more intuitive in Igor 7! There is a new Menu item called Statistics, where most of these functions have a dialog with more information. In Igor 6.3 you are stuck with the command line. Igor 7 will be out soon (July 2016). or type ShowHelpTopic “StatsMedian” in the Command Window (put whatever command you want help with between the quotes). Extra options are specified by “flags”, these are things like “/Q” that come after the command. For example, /Q means “quiet” i.e. don’t print the output into the history window. You should always either print the results to the history or put them into a table so that we can check them. Note that the table gets over written if you do the same test with different data, so printing in this case is a good idea. The defaults in Igor are setup OK for our needs. For example, Igor does two-tailed comparison, alpha = 0.05, Welch’s correction, etc. Most operations can handle waves of different length (or have flags set to handle this case). If you are used to doing statistical tests in Excel, you might be wondering about tails and equal variances. The flags are set in the examples to do two-tailed analysis and unequal variances are handled by Welch’s correction. There’s a school of thought that says that using non-parametric tests is best to be cautious. These tests are not as powerful and so it is best to use parametric tests (t test, ANOVA) when you can. If you are a cell biologist, you will have noticed the change in emphasis in our field. At one time, cell biology papers were – in the main – qualitative. Micrographs of “representative cells”, western blots of a “typical experiment”… This descriptive style gave way to more quantitative approaches, converting observations into numbers that could be objectively assessed. More recently, as technology advanced, computing power increased and data sets became more complex, we have seen larger scale analysis, modelling, and automation begin to take centre stage. The application of these areas is not new to biology and has been worked on extensively for years in certain areas. Perhaps most obviously by groups that identified themselves as “systems biologists”, “computational biologists”, and people working on large-scale cell biology projects. My feeling is that these methods have now permeated mainstream (read: small-scale) cell biology to such an extent that any groups that want to do cell biology in the future have to adapt in order to survive. It will change the skills that we look for when recruiting and it will shape the cell biologists of the future. Other fields such as biophysics and neuroscience are further through this change, while others have yet to begin. It is an exciting time to be a biologist. I’m planning to post occasionally about the way that our cell biology research group is working on these issues: our solutions and our problems. Top Trumps is a card game for children. The mind can wander when playing such games with kids… typically, I start thinking: what is the best strategy for this game? But also, as the game drags on: what is the quickest way to lose? Since Top Trumps is based on numerical values with simple outcomes, it seemed straightforward to analyse the cards and to simulate different scenarios to look at these questions. Many Top Trumps variants exist, but the pack I’ll focus on is Marvel Universe “Who’s Your Hero?” made by Winning Moves (cat. No. : 3399736). Note though that the approach can probably be adapted to handle any other Top Trumps set. What is the best card and which one is the worst? In order to determine this I pulled in all the data and compared each value to every other card’s value, and repeated this per category (code is here, the data are here). 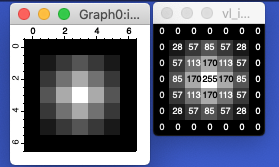 The scaling is different between category, but that’s OK, because the game only uses within field comparisons. This technique allowed me to add up how many cards have a lower value for a certain field for a given card, i.e. how many cards would that card beat. These victories could then be summed across all six fields to determine the “winningest card”. The cumulative victories can be used to rank the cards and a category plot illustrates how “winningness” is distributed throughout the deck. As an aside: looking at the way the scores for each category are distributed is interesting too. Understanding these distributions and the way that each are scaled gives a better feel for whether a score of say 2 in Wisecracks is any good (it is). The best card in the deck is Iron Man. 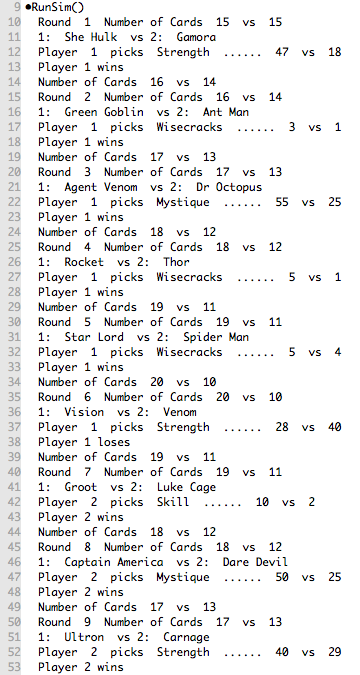 What is interesting is that Spider-Man has the designation Top Trump (see card), but he’s actually second in terms of wins over all other cards. Head-to-head, Spider-Man beats Iron Man in Skill and Mystique. They draw on Top Trumps Rating. But Iron Man beats Spider-Man on the three remaining fields. So if Iron Man comes up in your hand, you are most likely to defeat your opponent. At the other end of the “winningest card” plot, the worst card, is Wasp. Followed by Ant Man and Bucky Barnes. There needs to be a terrible card in every Top Trump deck, and Wasp is it. She has pitiful scores in most fields. And can collectively only win 9 out of (6 * 29) = 174 contests. If this card comes up, you are pretty much screwed. What about draws? It’s true that a draw doesn’t mean losing and the active player gets another turn, so a draw does have some value. To make sure I wasn’t overlooking this with my system of counting victories, I recalculated the values using a Football League points system (3 points for a win, 1 point for a draw and 0 for a loss). The result is the same, with only some minor changes in the ranking. I went with the first evaluation system in order to simulate the games. I wrote a first version of the code that would printout what was happening so I could check that the simulation ran OK. Once that was done, it was possible to call the function that runs the game, do this multiple (1 x 10^6) times and record who won (player 1 or player 2) and for how many rounds each game lasted. A typical printout of a game (first 9 rounds) is shown here. So now I could test out different strategies: What is the best way to win and what is the best way to lose? If you knew which category was the most likely to win, you could pick that one and just win every game? Well, not quite. If both players take this strategy, then the player that goes first has a slight advantage and wins 57.8% of the time. The games can go on and on, the longest is over 500 rounds. I timed a few rounds and it worked out around 15 s per round. So the longest game would take just over 2 hours. This one requires very little brainpower and suits the disengaged adult: just keep picking the same category. In this scenario, Player 1 just picks strength every time while Player 2 picks their best category. This is a great way to lose. Just 0.02% of games are won using this strategy. The next scenario was to just pick random categories. I set up Player 1 to do this and play against Player 2 picking their best category. This means 0.2% of wins for Player 1. The games are over fairly quickly with the longest of 1 x 10^6 games stretching to 200 rounds. If both players take this strategy, it results in much longer games (almost 2000 rounds for the longest). The player-goes-first advantage disappears and the wins are split 49.9 to 50.1%. How does all of this compare with selecting the worst category? To look at this I made Player 2 take this strategy, while Player 1 picked the best category. The result was definitive, it is simply not possible for Player 2 to win. Player 1 wins 100% of all 1 x 10^6 games. The games are over in less than 60 rounds, with most being wrapped up in less than 35 rounds. Of course this would require almost as much knowledge of the deck as the winning strategy, but if you are determined to lose then it is the best strategy. Head-to-head, the best strategy is to pick your best category (no surprise there), but whether you win or lose depends on the cards you are dealt. I looked at which player is dealt the worst card Wasp and at the outcome. The split of wins for player 1 (58% of games) are with 54% of those, Player 2 stated with Wasp. Being dealt this card is a disadvantage but it is not the kiss of death. This analysis could be extended to look at the outcome if the n worst cards end up in your hand. I’d predict that this would influence the outcome further than just having Wasp. So there you have it: every last drop of fun squeezed out of a children’s game by computational analysis. At quantixed, we aim to please. Repeat Failure: Crewe Alexandra F.C. Well, the 2015/2016 season was one to forget for Crewe Alexandra. Relegation to League Two (English football’s 4th tier) was confirmed on 9th April with a 3-0 defeat to local rivals Port Vale. Painful. Maybe Repeat Failure is a bit strong. Under Dario Gradi, the Railwaymen eventually broke into League One/Championship (the 2nd Tier) where they punched above their weight for 8 seasons. The stats for all league finishes can be downloaded and plotted out to get a sense of Crewe’s fortunes over a century-and-a-bit. The data are normalised because the number of teams in each league has varied over the years from 16 to 24. There were several years where The Alex finished bottom but there was nowhere to go. You can see the trends that have seen the team promoted and then relegated. It looked inevitable that the team would go down this season. Now, the reasons why the Alex have done so badly this season are complex, however there is a theme to Crewe’s performances over all of this time. Letting in too many goals. To a non-supporter this might seem utterly obvious – of course you lose a lot if you let in too many goals. But Crewe are incredibly leaky and their goal difference historically is absolutely horrendous. The Alex are currently in 64th place on the all-time table, between West Ham and Portsmouth, with 4242 points – not bad – however our goal difference is -952. That’s minus 952 goals. Only Hartlepool have a worse goal difference (-1042). That’s out of 144 teams. At Gresty Road they’ve scored 3384 and let in 2526. On the road they netted 2135 but let in 3945. Stats for all teams are here and Crewe data is from here. See you in League Two for 2016/2017. The post title is taken from “Repeat Failure” by The Delgados from their Peloton LP. Fans of probability love random processes. And lotteries are a great example of random number generation. The UK National Lottery ran in one format from 19/11/1994 until 7/10/2015. I was talking to somebody who had played the same set of numbers in all of these lottery draws and I wondered what the net gain or loss has been for them over this period. The basic format is that people buy a line of numbers (6 numbers, from 1-49) and try to match the six numbers (from 49 balls numbered 1-49) drawn from a machine. The aim is to match all six balls and win the jackpot. The odds of this are fantastically small (1 in ~14 million), but if they are the only person matching these numbers they can take away £3-5 million. There are prizes for matching three numbers (1 in ~56 chance), four numbers (1 in ~1,032), five numbers (1 in ~55,491) or five numbers plus a seventh “bonus ball” (1 in ~2,330,636). Typical prizes are £10, £100, £1,500, or £50,000, respectively. The data for all draws are available here. I pulled all draws regardless of machine that was used or what set of balls was used. This is what the data look like. The rows are the seven balls (colour coded 1-49) that came out of the machine over 2065 draws. This gives us the following. Crunching these combinations against the real-life draw outcomes tells us what would have happened if every possible ticket had been bought for all draws. If we assume a £1 stake for each draw and ~14 million people each buying a unique combination line. Each person has staked £2065 for the draws we are considering. The luckiest line is 3, 6, 13, 23, 27, 49. These numbers won 41 x three ball, 2 x four ball, 1 x jackpot, 1 x 5 balls + bonus. Out of all possible combinations, 13728621 of them are in the red by anything from £5 to £1945. This is 98.2% of combinations. Pretty terrible odds all-in-all. Note that I used the typical payout values for this calculation. If all possible tickets had been purchased the payouts would be much higher. So this calculation tells us what an individual could expect if they played the same numbers for every draw. Note that the unluckiest line and the luckiest line have an equal probability of success in the 2066th draw. There is nothing intrinsically unlucky or lucky about these numbers! I played the lottery a few times when it started with a specified set of numbers. I matched 3 balls twice and 4 balls once. I’ve not played since 1998 or so. Using another function in my code, I could check what would’ve happened if I’d kept playing all those intervening years. Fortunately, I would’ve looked forward to a net loss with 43 x three balls and 2 x four balls. Since I actually had a ticket for some of those wins and hardly any for the 2020 losing draws, I feel OK about that. Discovering that my line had actually matched the jackpot would’ve been weird, so I’m glad that wasn’t the case. There’s lots of fun to be had with this dataset and a quick google suggests that there are plenty of sites on the web doing just that. Expected number of appearances is 295 (14455/49). Since October 2015, the Lottery changed to 1-59 balls and so the dataset used here is effectively complete unless they revert to the old format. The title of this post comes from “Wrote for Luck” by The Happy Mondays from their 1988 LP Bummed. The Manic Street Preachers recorded a great cover version which was on the B-Side of Roses in The Hospital single.